So Where Did All This Stuff Come from, Anyway? A nostalgic website of the depth and breadth of this one (quite possibly the largest collection of electronic memorabilia of its kind from its time ever assembled on the web) does not spring forth by itself, nor is it solely the result of the efforts of just one person. In fact, it suddenly occurred to me after seven years that when I started the site I did not own a single photograph or any other souvenirs from high school or from our little town but for my yearbook. And I certainly had no idea what I was doing or what it would mean to so many people. tribute to in June 2003. 10 Brother of Howie Levy, for his hard work editing the videos on the site. Special mention should be made of the late brother of our own, Kathy Cullen, Vic Cullen (1958), whose contribution consisted of unknowingly providing the inspiration to begin developing this website in late 1999. Vic was a disabled veteran who passed away at age 73, June 12, 2012. 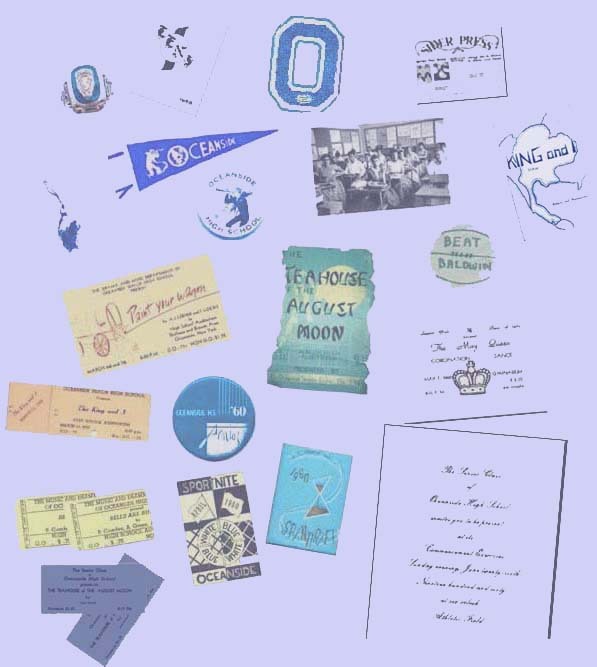 The generosity of these classmates and other OHS alumni in making these treasured mementos available to share with our entire class and other visitors to this site and to help restore our sweet but fading memories is gratefully acknowledged. A special thanks goes out to certain OHS faculty members who contributed material our memories are made of: first, our music teacher and band/orchestra director, Allan Segal, for the live recordings from our production of The King & I on the OHS stage in 1958 made by someone unknown to us, and second, Coach Roy Chernock for photos of our championship track team. Mary Hyland of Nathan's Famous, Inc. for her efforts in obtaining for us, after a year-long search, a then rare photo of our , as it was when we were kids, that is now featured on own website's history page. Oceanside Fire Department's Terrace Hose Company #3 (for the photos of the St. Anthony's fire). Morton Shor, son of Leon Shor (co-founder of the Roadside Rest) for the interview. Andrew Ceroni for permission to use his poem, "Remembrance." Joseph E. (Joe) Behar, PhD (Long Beach High School, 1960), Professor of Sociology, Dowling College, Oakdale, NY, and Chuck Jacobi (LBHS, 1973) for permission to use great photos of the Long Beach boardwalk. Several sellers on eBay.com for making various memorabilia items available online. Jerry and Lillian Katz, beloved parents of twins, Jay Katz and the late Michael Katz, and Barbara Katz (Michael's loving widow), all of whom provided photos for Michael's memorial page. Shannon Turner, daughter of the late Tom Turner, for photos of her dad for his memorial page. Lloyd Handwerker (a grandson of Nathan and nephew of the late Murray Handwerker), producer/director of the acclaimed documentary film, Famous Nathan, and Gil Reavill, co-authors of the book by the same name. Greg Iger, cousin of the late Don Fine for photos for Donny's memorial page. Josh Rindner, son of our late classmate, Lois Rindner, for photos of his mom. Brie Wilensky Williams and Brooke Wilensky, daughters of the late Hal Wilensky, for photos of their dad for his memorial page. Frank Yacovelli, owner of Oceanside Gulf, and his charming wife, Eleanor, for the memorable photo of his gas station where my father worked for 10 years. Hal Behl, husband of the late artist, Reggie Behl, for digital images of his late wife's Oceanside-themed art work from the 1950s. Nathan Handwerker's grandson, Bill Handwerker, author of Nathan's Famous: The First 100 Years, for the photo of his grandfather's caraciture created in 1959 by NY Post cartoonist, John Piorotti, upon the occasion of the takeover of our Roadside Rest by Nathan's Famous, Inc.
Heidi Winkler, widow of Bruce Winkler, for the photo of and information about Bruce. For assistance with the formidable technological challenges when I was just getting started in late 1999 and early 2000, I thank Craig Pravda (brilliant son of our late classmate and my dear old friend, Joel Pravda) and some of my business associates in Las Vegas, Nevada, Garrett Larson, Josh Kern and for assisting with the audio, Richard Bowler. And I thank my cousin, Mark Roth, who helped me obtain some of the music. And I thank particularly our now late classmate, Ed Chilton, for enhancing some of the graphic images, for inspiring me early on to strive for excellence, and whose help debugging and improving the site after its launch in early 2000 has been of enormous value. Another special thank you to our classmate, Dave Schwarz, who spent hours in public libraries on Long Island in 2003 reading microfilms to assist with the research and who, as a result, found the Newsday ad from opening day, thus proving that its elusive date was, in fact, June 4, 1959 (and not in 1955 as reported elsewhere. Others who have submitted material for our Memory Book page are, of course, acknowledged there. So if "a few more tokens rest" within your treasure chest, "a photograph or two," from among your souvenirs that you would like to share with the class, this website is your central repository for them. Send them to me, Howie Levy, at 252 Hickory Hollow, Las Vegas, NV 89123-1177, and your name will be added to this list. Be assured that your treasures will be returned to you unharmed. Or you can send me by e-mail electronically scanned image files (preferably .jpg or .gif files) of them. And many thanks to all of you who read this. I hope you visit whenever you are feeling a little nostalgic, when you want to clarify a foggy memory, or of you just need a lift, and I hope that you enjoy the site for many years to come. Copyright © 2000-2018 by Howard B. Levy and 1960 Sailors Association Inc. All rights reserved.